THE APRIL 30, 2019 PUBLICATION DATE IS A PLACEHOLDER. THE DEPARTMENT OF JUSTICE WILL RELEASE THE REPORT ON APRIL 18, AND WE WILL PRINT AND SHIP OUR EDITION TO ALL RETAILERS IN 3-5 DAYS. An introduction by constitutional scholar, eminent civil libertarian, and New York Times bestselling author Alan Dershowitz. The relevant portions of Title 28 of the Code of Federal Regulations, the 1999 provisions written by former acting Solicitor General Neal Katyal, which establish and regulate the powers of the special counsel. Rod Rosenstein’s 2016 order appointing Robert Mueller III as special counsel and outlining the scope of his investigation. Attorney General William Barr’s four-page summary of the report, as sent to Congress. The wait is over. Robert Mueller, a lifelong Republican, has concluded his investigation and submitted its findings to Attorney General William Barr. Barr has told Congress that Mueller found no proof of collusion between the Trump campaign and Russia, and did not come to a conclusion on obstruction of justice—neither concluding the president committed a crime nor exonerating him. But Mueller’s report was over 300 pages and Barr’s summary was only four pages, raising questions about the conclusions of a historic investigation. Special Counsel Robert Mueller III’s probe into Russian influence on the 2016 election of Donald Trump—including links between the campaign and Russian interests, obstruction of justice by President Trump, and any other matters that may have arisen in the course of the investigation—has been the focal point of American politics since its inception in May 2017. Democrats in the US House of Representatives hoped to use the report to begin impeachment proceedings, with the support of those critical of the president. Media tracked Mueller’s every move, and the investigation was subject to constant speculation by political pundits everywhere. It resulted in the indictments of Michael Flynn, Paul Manafort, Roger Stone, and many others. President Trump and his supporters affirmed that the investigation was a “witch hunt” and the product of a plot by the political establishment—the “deep state”—to delegitimize his presidency. Mueller’s findings—at least according to Barr—allowed the latter to claim victory. But now, thanks to a subpoena from House Judiciary Committee chairman Jerry Nadler for the full report, a resolution from the House of Representatives to release the full report to the public (though blocked in the Senate by Mitch McConnell), and popular demand, it’s time for public to judge if that is true. The Mueller investigation will join Watergate, and the Mueller Report will join the 9/11 Commission Report, the Warren Report, and the Starr Report, as one of the most important in history. The Mueller Report is required reading for everyone with interest in American politics, for every 2016 and 2020 voter, and every American. 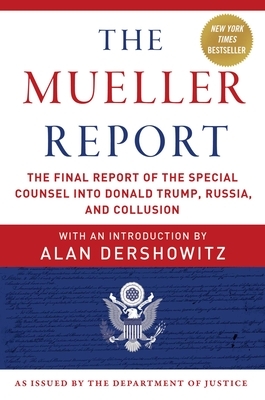 It’s now available here as an affordable paperback, featuring an introduction from eminent civil libertarian, Harvard Law Professor Emeritus, and New York Times bestselling author Alan Dershowitz, who provides a constitutional, civil law-based commentary sorely needed in today’s media landscape. Alan Dershowitz is one of the most famous and celebrated lawyers in America. He was the youngest full professor in Harvard Law School history, where he is now the Felix Frankfurter Professor of Law, Emeritus. Dershowitz is the author of numerous bestselling books, including the New York Times bestseller The Case Against Impeaching Trump. Robert S. Mueller III is the special counsel of the investigation into Russian interference in the 2016 election and any other matters that arise from his findings. He served as director of the FBI from 2001 to 2013. Mueller, a registered Republican, had dedicated his life to public service and has assembled a decorated criminal justice career. He also served as a Marine in the Vietnam War, and received a Purple Heart and Bronze Star for heroism. The U.S. Department of Justice has a mission to enforce the law and defend the interests of the United States according to the law; to ensure public safety against threats foreign and domestic; to provide federal leadership in preventing and controlling crime; to seek just punishment for those guilty of unlawful behavior; and to ensure fair and impartial administration of justice for all Americans.